Hello Fringe fanatics! I'm finally getting to this recap. As, I mentioned last week, I planned to be delayed. I have attended several midnight showings of movies in the past and they were a good time. But, I was also in my 20's! I watched Fringe last night and bolted to the theater to get a good seat for the show. Yeah...I forgot we'd have to sit there for 2 hours before the movie even started! I almost fell asleep! And then there were all these teenagers and 20-somethings dressed up as wizards, witches, scarecrows (I know...what???) and they were dueling in the aisles. The worst thing about the dueling? The crowd was actually enjoying it and not covering their head in their hands and shaking their heads in shame! Bottom line? I think I'm getting old! So...yes Deathly Hallows Part II? I'm hitting up a matinee! Awesome movie though! Sidebar over. Speaking of awesome... HOW AWESOME WAS FRINGE LAST NIGHT!?!?!?! No, what we were hoping to happen didn't quite happen, but we can't say that the plot did not advance in a majorly exciting way! We still got our case of the week (spoiler alert, if you haven't seen this week's THE EVENT and actually care to remain spoiler free about the show - I'm going to be kinda referring to it! ), we had Olivia making some allies in the Alternaverse, and we got our hope that she is going to find a way out of it one day! Perhaps with some help from our favorite Bishop Boys! Let's do some recapping! 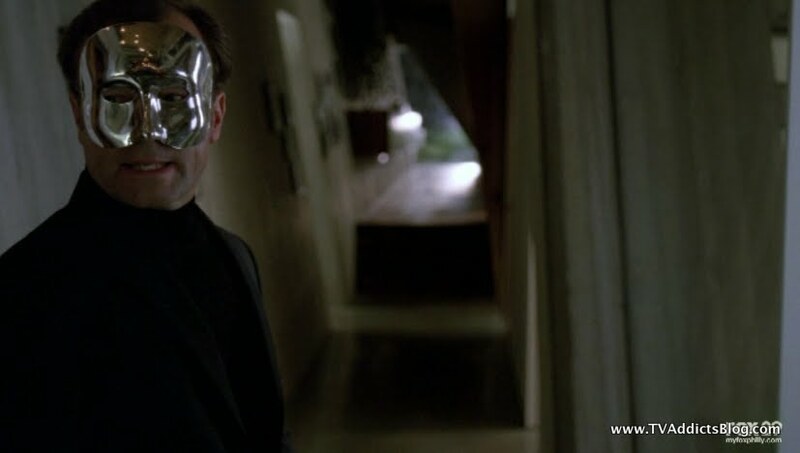 So, how creepy was THE CANDYMAN? It was a nice tie-in that a kidnapping would be a Fringe case in alterna-land because Walter considers these all possible Fringe events due to Peter being "abducted" and taken to the other side. But the story was brought closer to home due to the fact that Bizarro Broyles's son was a former kidnap victim of the Candyman! 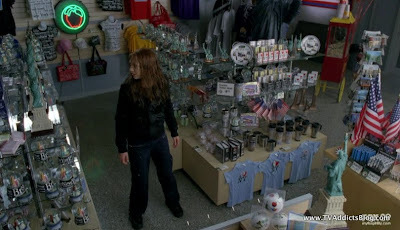 If it wasn't for OUR Olivia being involved with the case, they probably would have never found the Candyman in time. They had a set amount of time, based on previous cases, before the damage to the child is irreparable. 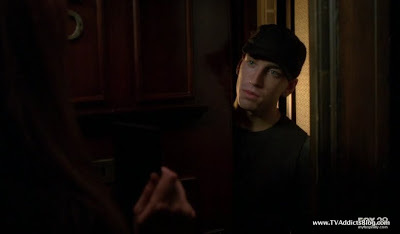 Olivia wanted to talk to Broyles's son Christopher, something that Lincoln and Charlie advised against. 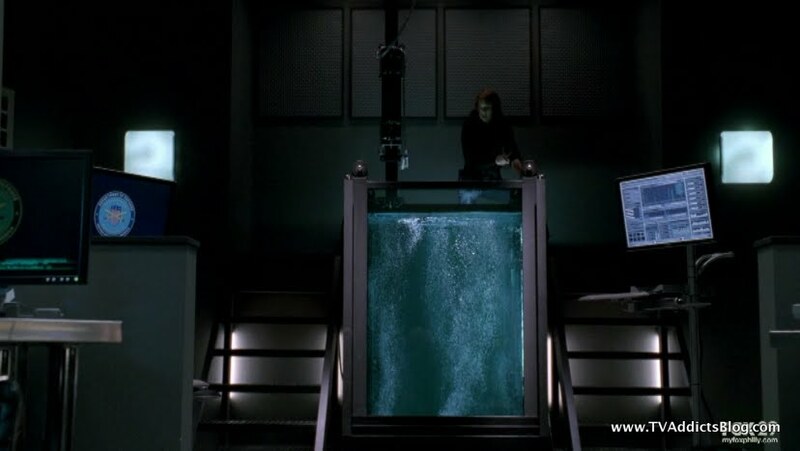 Broyles wasn't keen to the idea but his wife is apparently a big fan of Fauxlivia. 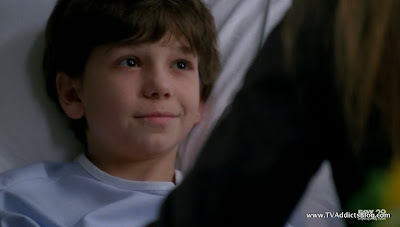 Anyway, Olivia talks to Christopher about the abduction. Christopher's life expectancy has been cut dramatically short and he has lost his sight. He tipped off Olivia on a phrase that he remembers one of the men saying. "Through the pitch dark comes a cleansing fire." We heard the Candyman say this in the opening scene of the episode along with a whole biblical-like passage. Christopher was scared to tell Olivia any details because he was threatened that they would come after his family if he told them anything. But Olivia got the information out of him. Olivia is the first to speculate that the 2 men may have been the same man. She turned out to be right on that one. But they also went to some crazy church that was known for using this biblical expression and met with a man, Reverend Marcus about the Candyman. Broyles and Olivia asked for the names of all of the men in Marcus's congregation. He was not very forthcoming with the information. 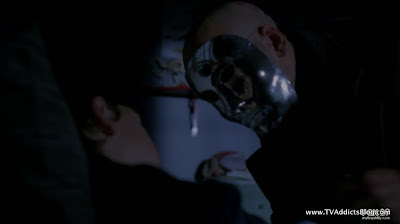 Of course, Broyles tells the guy that his son can identify the voices of the kidnapper(s). Whoops! They got a roster of 40 names and the Fringe team split them up. Naturally, Olivia knocks on the door of the Candyman! He looks a lot younger than we last saw him. It isn't long before his ruse is up. Olivia goes into ACTION mode, finds Max (the kidnapped kid) and shoots the Candyman! Broyles, feeling some peace has finally come to him and his family, tells Olivia that he will never forget this. We have to keep in mind, and will discuss more in the next section, that Broyles is fully aware that this is the Olivia from the other side and that Walternate is pretty much done with his use for her as he has discovered the element in her brain that allows her to cross worlds. 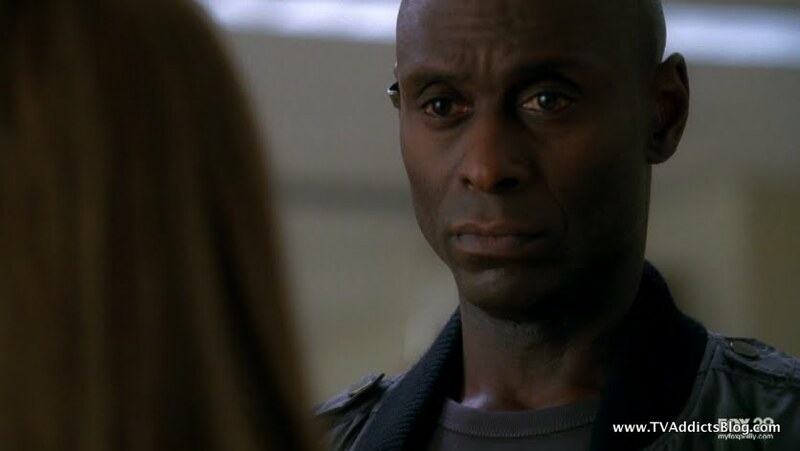 He told Broyles that if Olivia realizes who she is, she will have to be "dealt with" or "disposed of!" Later on, Olivia had a brainstorm while talking to Henry about having to LEARN how to drive a boat. 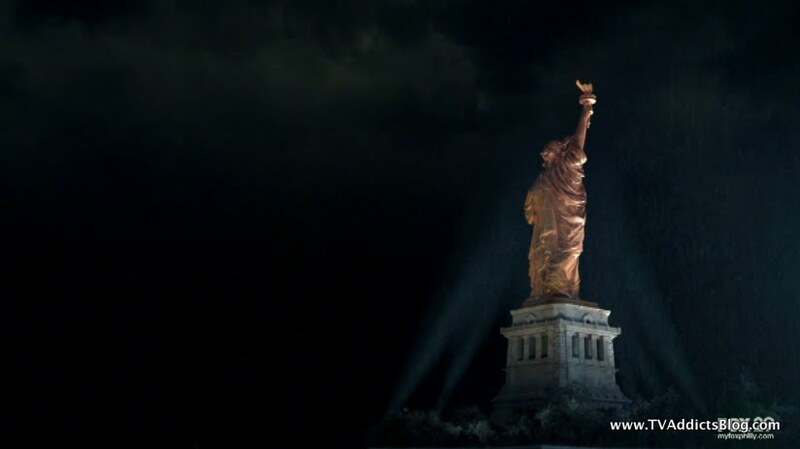 When her escape from this universe was imminent, she could not leave Christopher and Broyles' family in danger. She called Broyles up and told him that Reverend Marcus was the mastermind behind the kidnappings and that Christopher had said he had been threatened if he "told" on them. 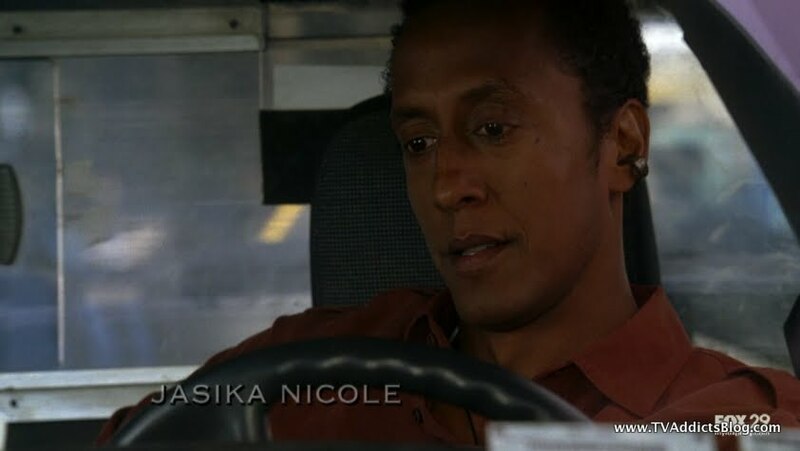 Olivia and Broyles rush to the Broyles Residence and got there just in time. 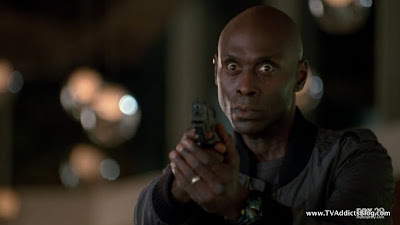 Broyles shoots Reverend Marcus and saves his son. They are all in the hospital later and Olivia runs into Max's mother who said he is going to make a full recovery. He wanted to thank the woman that saved her. I don't know about you but I didn't bat an eye when Olivia said FBI when saving Max. Max questioned her on it and she played it off. But Broyles heard the whole conversation. 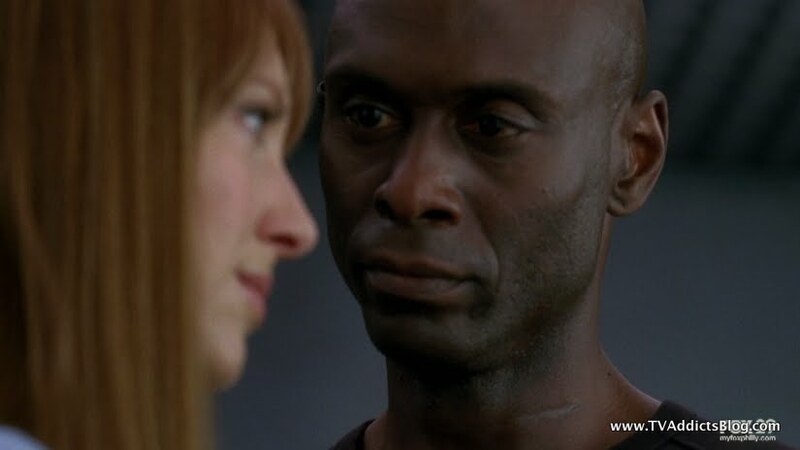 Broyles and Olivia had a realization that they both knew who she really was. Olivia asked what happens now and Broyles said he is going home. The Bizarro Fringe team starts out as villains but now we see these people aren't so bad. And Olivia is starting to see that too. I think we saw this coming. 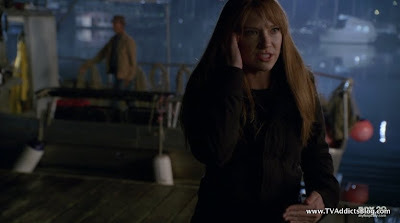 I'm going to guess we're going to feel sympathetic towards Fauxlivia too. 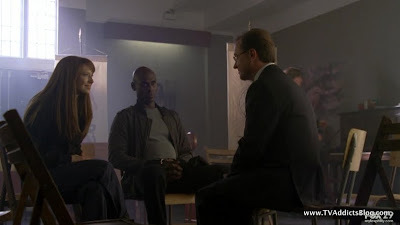 They even tried to provide us with some sympathy to Walternate when he told Broyles that they can talk anytime about the kidnappings since it is a common bond they share. I definitely can't wait to see where they're going with it all! As we speculated last week, Olivia tracked down Cab Driver, Henry for help in getting home! He is the only person that believed in her. While reluctant, he was quick to get on board. He didn't understand why Olivia needed to get to D.O.D. Liberty Island to get home though. But a relative of his had a boat and he told her to give him a couple days. Henry was nervous about getting caught in all of this, especially when Olivia showed up late and then left to go on her rescue mission. But he stuck around. It was great when Henry asked her to come clean and tell him where she is really from. "I'm from a parallel universe!" And then she jumps in the water to swim to Liberty Island. Fantastic. I'm sure he really bought that. 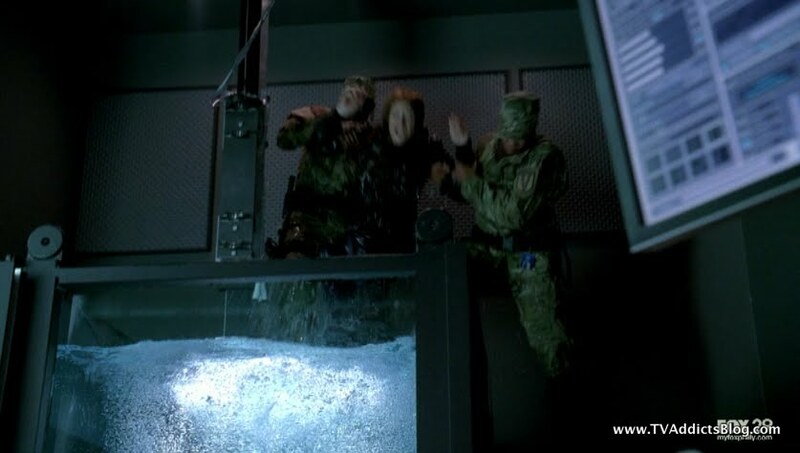 Olivia finds her way in, but we find out Walternate is made aware of the security breach. Whew this was an intense moment. Olivia puts the breathing apparatus on and jumps into the tank fully clothed. It didn't take 5 hours this time she instantaneously found her way back to our world! Of course, due to the time of night, the gift shop on Liberty Island was closed. There was a cleaning lady there. Before she could be let out of the place, she realized she was being sucked back into their world. She had to think quick and told the cleaning lady that this may sound crazy but please do such and such. Yeah, if I saw a woman appear and disappear out of nowhere and gave me instructions to do such and such, I might do it too! Or, I'd just check myself into a mental hospital! 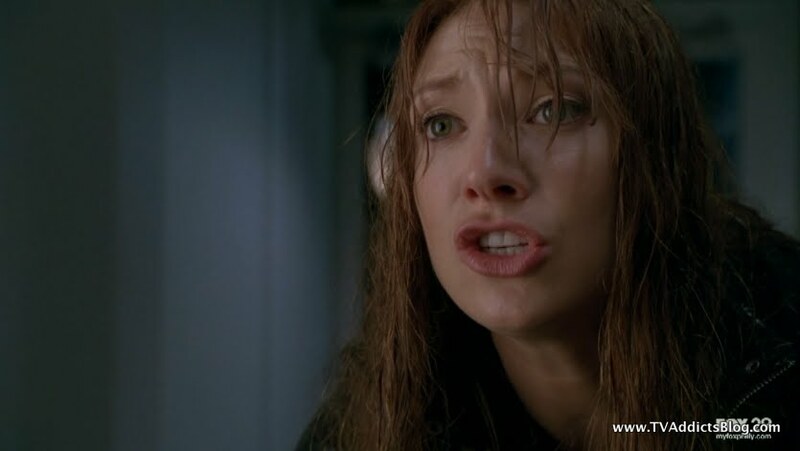 Olivia is pulled back into Alternaland and this time she screams "I don't belong here!!" Oh boy...her time may be running short there. But now she has 2 allies in Broyles and Henry. And what if Broyles lets Lincoln and Charlie in on the rouse. They may be upset at first but may realize how much this Olivia has helped them with her knowledge. We'll see! HE KNOWS!!!! Peter knows! Which means Walter will know and all of our friends in our world will know that they're dealing with a Fake Olivia and a massive plot against them. Exciting times people! Exciting! 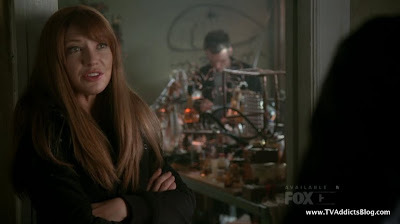 Now, let's just forget the fact that this woman would be able to find Peter Bishop's cell phone number and call him in Boston. Maybe Olivia was able to give a little more information before we saw her dragged back into the other universe. How will Peter react to this news? Yikes, it's going to be disasterific! And we're going to have to wait fo 2 weeks to see how any of it plays out (Thanksgiving next week. I do like to eat, but I may like Fringe more!!) Anyway, we have a few more things to tackle before we call it a day. Glyph of the Week - This week's Glyph spelled out ESCAPE. No big mystery to what that means this week! 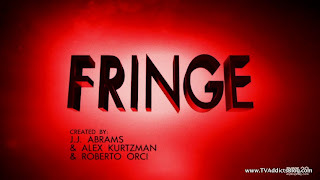 Thanks to Fringepedia for the picture! Observer Spotted - You had to look really close to see that crazy Observer this week. He was outside of the diner where Henry and Olivia were meeting. Casablanca - Fauxlivia recalls Casablanca as a movie with Ronald Reagan and the couple walking off into the sunset happily ever after. 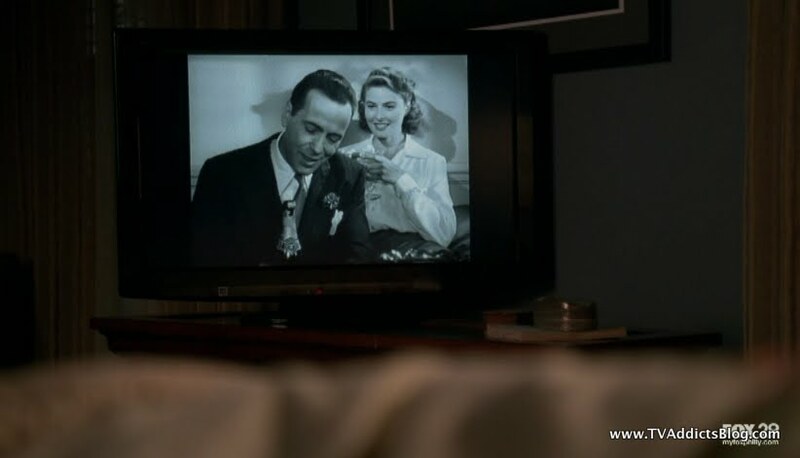 However, it is Humphrey Bogart and she leaves him in the end. 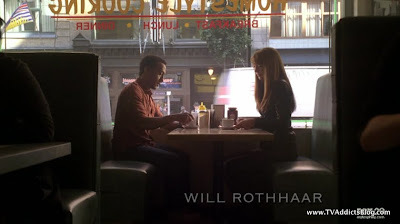 Perhaps a little foreshadowing to how Fauxlivia will be leaving. Anyone else find it funny that these people are so advanced in technology but Olivia still carries a pager? I'm sure there was nothing meant by it, but it was still pretty funny! 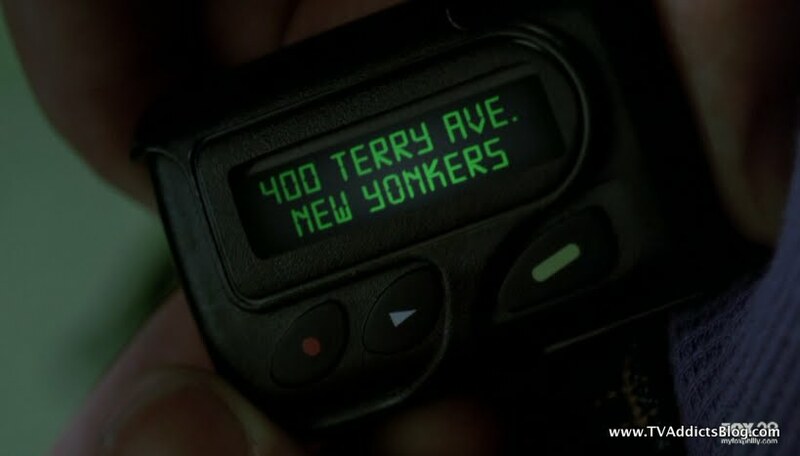 And of course the town they are asked to report to is NEW Yonkers and it's just Yonkers in our world. Didn't really spot anything else crazy in this episode, but if anyone else did feel free to share! Again I apologize for the delay on the recap, but at least I got to it! We'll be back in 2 weeks. In the meantime, don't forget to keep checking back for my thoughts on The Event and The Walking Dead! Hope you enjoyed my ramblings and I'll see you for some more Fringe in 2 weeks! I also have been unable to resist sharing my thoughts on The Walking Dead! It has a LOST-like survival tale feel to it with great characters. Don't miss the boat on this one! Ok - I'm dome messing with you Mike and now I'll read the recap. Yeah, for the first few Harry Potters it was a tradition for me to go Sunday afternoon. It wasn't bad at all! (this was before I read the books and was totally into it though!) I think I still caught Goblet on a Sunday after reading the books. I think I did Friday night screenings of Order and Prince. So, this was my first midnight one. I just was getting so psyched and figured "WHY NOT?!?!" Now, I have my answer! Actually my favorite part of the night was waiting for the movie with these girls sitting next to me. One asked the other "Why didn't we get our 3D glasses? I thought this was in 3D" Then the other girl said "Maybe we don't need the glasses. Maybe it just IS!!!" LOL Oh God, and they were totally serious too! Yes - you did mention being a 49ers fan ! And I respect someone who never stops rooting for their team even though they don't win. Giants have have some pretty dry years too. Go birds ? We eat birds this time of year! Especially turkeys with NO RINGS. ROFLMAO. All in good fun my friend. Loved the ep - sad to have to wait 2 weeks - but knew we would. Agree, we all saw the softening of the faux crew for awhile now. But - still want to know what is the deal with Astrid since the producers stated she in not geneticaly the same like our other dopplegangers. Guess we'll know soon. Have a good weekend every one ! Well, the Philly Phaithful have turned in support of their time once again after thinking this was going to be a lousy season...and think they'll have that chance one more time to get a ring. All hope lies in the man with all of the dogs...Mr. Vick! Say what you will about his personal life, he is playing out of his skull on the field these days. We'll see what happens! Yeah, I definitely want to know what the difference between the 2 Astrids is too....I'm sure they'll cover it somehow in the show! 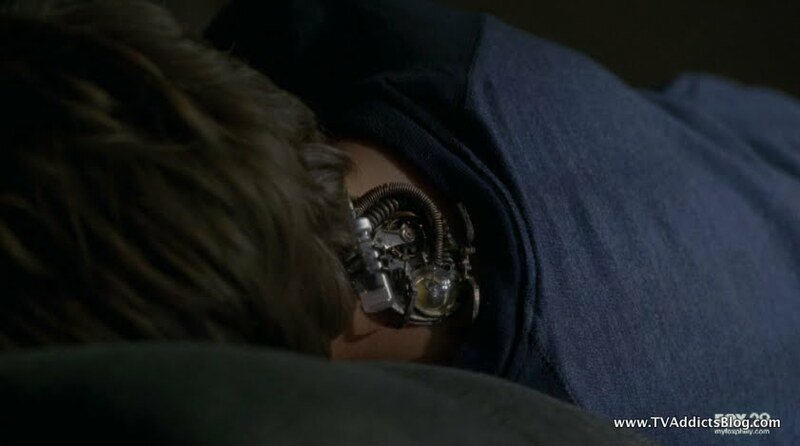 Best episode ever... loved it! My cable went out last night so I had to wait to watch on Hulu today. Mike, so you're a 49ers fan but were rooting for the Phillies over the SF Giants in baseball? I grew up in San Fran, so huge fan of everything bay area, especially the Gigantes. OUCH Bryan! At least you still got to see the episode. 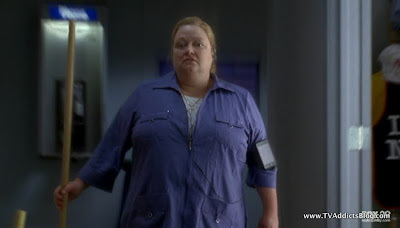 And, not sure if I'd go as far as best ever for me...there have been some great ones...but I LOVED the episode! I guess you missed the part where I'm a Philly Sports fan! lol I grew up in South Jersey and still live in the outskirts of Philly so Philly sports is where it's at. But I strayed when I was a kid and started following the niners. I won't lie and say I didn't jump a bandwagon...but at least I stuck with them even when they got really bad! lol I do like the Eagles though, so it can be quite conflicting sometimes! I grew up with the Phillies though...even though they were lousy, I still loved them. Went to a lot of games, loved that crazy Philly Phanatic (still do!) Lots of great memories there. So when they won the World Series in 2008 that was really special! I was too young to remember them winning in 1980. As for the SF Giants...nope sorry! It's a one team only affair with the Bay Area! But I do love the city. San Fran has to be one of my favorite towns! 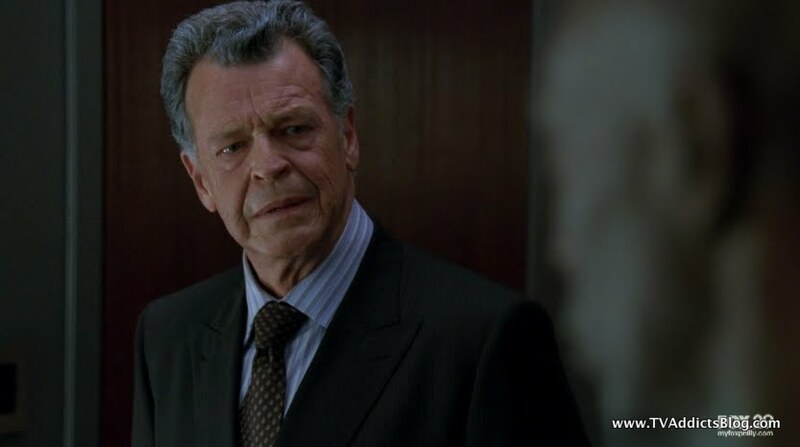 I love how this conversation has strayed from Fringe and Harry Potter into my weird antics as a Sports Fan! Bad news folks...Fringe has been pushed aside to Fridays for the American Idol juggernaut. I am so tired of that show. I know I blogged it for seasons but the show has been past its prime for years and this just blows! I know Smallville has had success on Fridays but I don't know if FOX will do the same thing. It's a FRIDAY!! I mean, I can't even guarantee I'll be blogging it every Friday night...if ANY Friday night at all! Not good news at all folks...but at least we have the rest of this season to look forward to. Maybe they'll be generous and give it more. I really hope Idol tanks this season. AAAHHHH, Fridays I work until 9pm! I am only about 10 minute walk from work, but, but, but, OH NO! I like Fringe even more knowing the glyphs, can't believe I never knew that before a few weeks ago, thanks for turning me on to that! I always forget to look for the observer, and can't even see him in that shot you have, but I trust you! You can recap on Saturdays, we will all wait! I didn't notice the FBI either, I was suprised she didn't try to cover with Fringe Bureau Investigation or something. I also read the Fauxivia and Casablanca differently, I thought she was guessing, not remembering it differently from her world, like the was no Casablanca or Bogart in Aultland, which would then make no Reagan either I guess. Who knows? Maybe Fridays won't hurt Fringe, perhaps we Fringeheads are older, wiser and not out partying so much on the weekends as much as staying home watching TV? As for Fridays...you could be right that maybe it won't affect it. It may be better because it was getting slaughtered on Thursdays. Smallville and Supernatural have done fine on Fridays but the CW has a different standard for ratings. X-Files was on Fridays back in the day but back then Friday wasn't a death slot! What really fires me up is that on Tuesdays they're not even airing new episodes of anything at 8:00....nope they're airing an Encore episode of Glee. I know...Fringe and Glee would be a bizarre 8-10 combo but come on!!! That is valuable real estate! And they used to air Fringe after Idol and it did just fine. All this means is that FOX is not in Fringe's corner anymore. So it's up to us to spread the word of its awesomeness. So, I'm going to have to find a way to keep blogging it! Saturdays? yeah maybe some Saturdays I'll be able to write up a recap. But it's going to be a lot tougher. I was used to my late night/less sleep recapping schedule! lol We'll see what happens. I'm not thrilled that Fringe is moving to Friday at 9pm - I am a huge Supernatural fan ! Funny how friday has become such a death night - it did not used to be. It's only because they stopped showing good stuff that people stopped watching. SyFy for years had stuff on fridays that did fairly well. I had hoped that maybe Fringes live ratings could improve on friday - but now I can't watch it live. Damn. Yikes - I CAN remember the phillies winning in 80 Mike - so now I feel old. LOL I stopped watching baseball 2 or 3 strikes ago but when I did watch I was a yanks fan - but I rooted for the phillies in 80 cause I didn't want the american league team who beat out my yanks to win, so I remember cleary the phillies winning. @MJ - Yeah, I totally agree Fridays used to be a good day for TV. Actually, outside of SyFy I think I remember my parents watching DALLAS every Friday night. It was a cue for me to go down the basement and play with my toys because I wasn't watching TV! lol But I also remember when Quantum Leap moved to Fridays and I watched that every week. Wouldn't miss it! Of course, I wasn't into ratings back then so I'm not sure if it the ratings were so poor for QL that maybe it was moved to Fridays because of it. FOX's Entertainment Pres Kevin Reilly is pretty optimistic about Fringe on Fridays. He said it was no slight against the show. 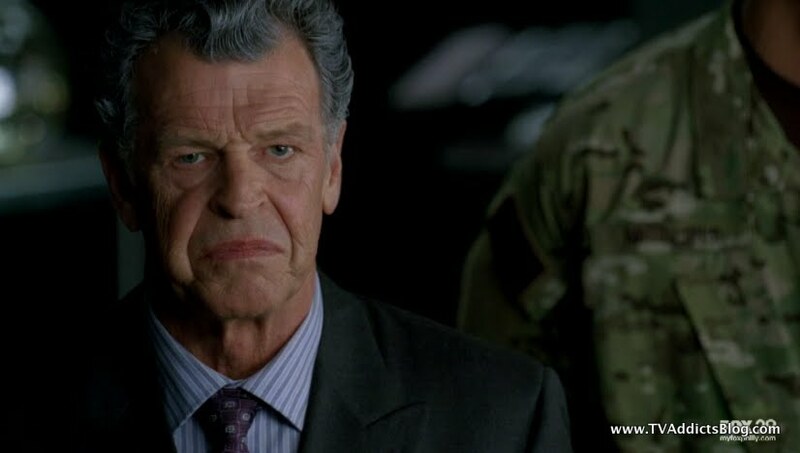 They looked at numbers and realized that 45% of Fringe's audience "Time Shifts" the show on DVR so he doesn't think moving it to Fridays will affect it too much. If it performs near the Thursday numbers on Friday then it's a WIN. I'll believe it when I see a renewal! And they would do good to show Fringe and the fans a bit of faith and give it an EARLY renewal! I agree that these last few years have been great to phillies fans - they had a very long drought. My mother-in-law died 3 years ago and was a long time fan and did not get to see them win the series. Eagles fans blow hot and cold ! They hated Vick, but now he's doing good they love him. Guess that is true for all cities/ fans - not just philly. 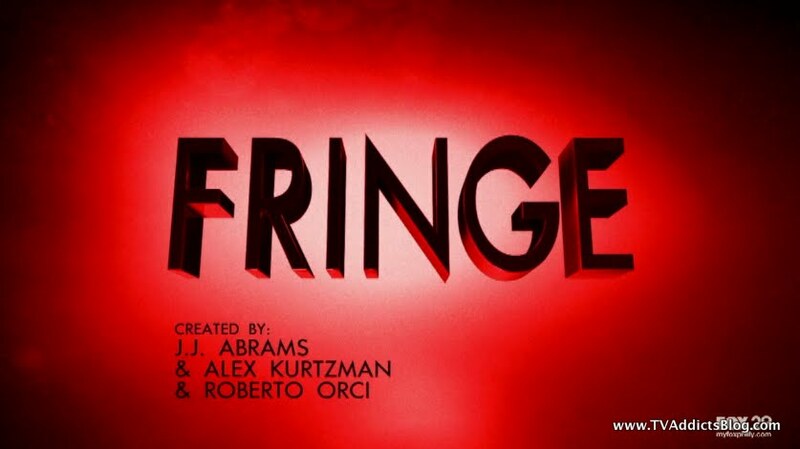 Not sure if anyone will see this but check out this awesome Fringe Trailer for Thursday! This was one of the best episodes ever..i was actually brought close to tears many times..i guess stories with kids kidnapped and then becomming a special needs type of situation was upsetting to me, i was so glad they shot both of them, though i wished i could have ported them over to the zombie attacks last week on The Walking Dead.. 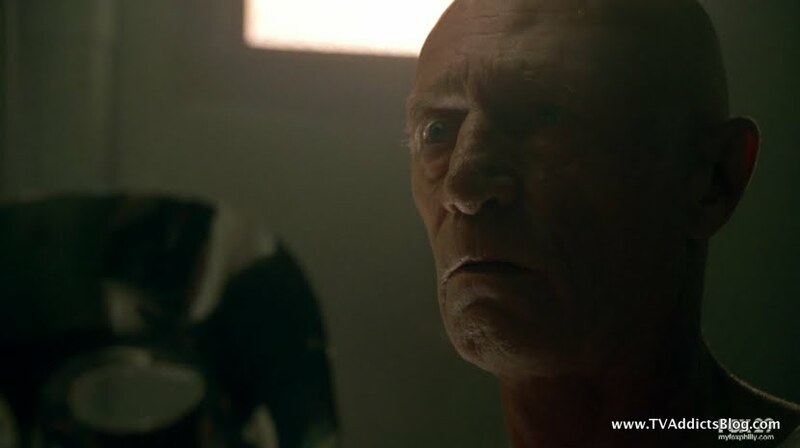 I think Broyles has a family in our world, but they are divorced..i remember something from the first season off handedly mentioned..
was that biblical passage the same one on the doomsday machine Peter is connected to? I swear i remember something about it..
i thought the Pager was hilarious too, i was like "really? a pager when your cell phone looks like an earing?" 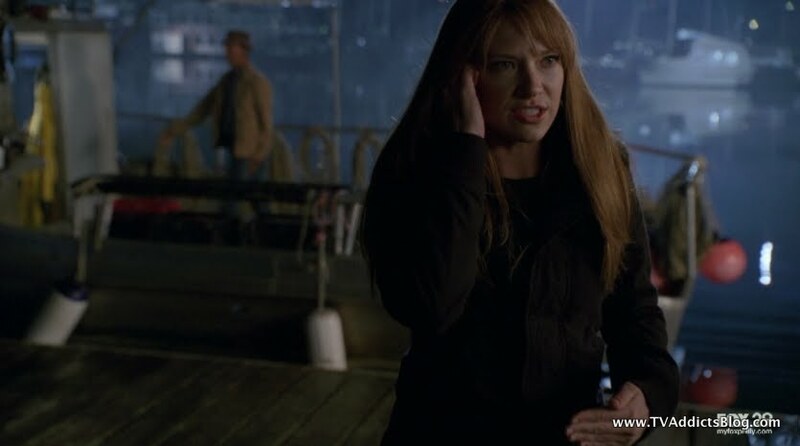 yes we are more sympathetic to the alternates, but like ive said, its still hard to trust or feel sympathetic for fauxlivia when she is constantly just killing innocent people (including the Deaf) for no real reason..